Elvira Kalviste | THE NIBBLE. 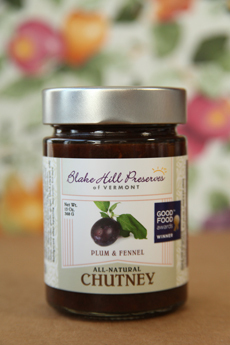 Blake Hill Preserves is an artisan chutney, jam and marmalade producer based near historic Grafton Village in Vermont’s Green Mountains. There, a gifted duo traditionally crafts all-natural chutneys, jams and preserves with sophisticated modern, bright, fruit-forward flavors and marvelous textures. You can see the difference, even before you taste it. Each small batch is slow-cooked by hand, carefully layering the ingredients to concentrate intense, fresh flavors. All of the ingredients are top quality ingredients, many organic. The line is certified kosher by OU. One weekend in 2009, Vicky, a third-generation English preserve maker, turned a bumper crop of wild blackberries growing on Blake Hill Farm into 70 jars of glistening jam. 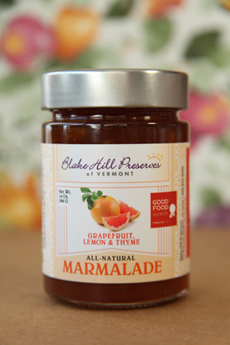 A friend sneaked a jar to the local grocery store and returned an hour later with Vicky’s first jam order; Vicky and Joe Hanglin formed Blake Hill Preserves and have been pleasing demanding palates ever since. Joe, who grew up in Gibraltar with British, Spanish and Italian ancestry, brings his culinary heritage to the line of chutneys, some of which are made with fruits, vegetables and spices inspired by Moroccan tagines and the flavors of the Middle East. We were thrilled with the samples they sent us, and recommend them to all for personal enjoyment and gifting. The 200-year-old farm, purchased in 2004, came with meandering old stone walls, beautiful wooded trails and an abundance of wild blackberry and raspberry bushes. Vicky and Joeadded blueberries, gooseberries and blush-pink rhubarb, all of which are use to make the wonderful spreads. The products are completely natural, low sugar, low salt, gluten free and fat free. Beyond spreads, they are delicious with cheese plates, with grilled paninis and other sandwiches, as condiments for everything from barbecue to winter stews, as dessert toppings and much more.